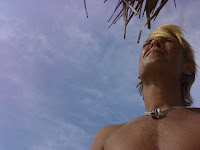 “I can tell u exactly when kitesurfing first started in Sri Lanka. The first person kitesurfing here was a German guy called Ben. I was tattooing in ‘Ranjiths Beach Hut’ in December 1999. While I was tattooing I noticed out of my eyes some color on the water - when I looked out the window I saw a guy with a kite starting from Mambos and strait out thorugh the main point. (I already had a piece of paper with a picture of a kitesurfer I ripped out of a magazine in Italy, cause when I saw that I knew that was my call). I was stoked; I jumped up and told my customer we had a 20minutes break. I ran to the beach and waited for him to return. That was Ben. He had a Naish Ar 3.5 and the first big Naishkiteboards. He gave me a magazine in the evening and told me all about it. I never forget the first picture I saw of Robby Naish jumping - I was so happy. In January I went to Denmark met Jan Blæsild and Peter Boldsen. Got my first kite and launched it first time in February 2000. Is it difficult to kite-surf? Can you learn how to do it without knowing how to surf? 2. difficult - well its upto the individual. i took 4 weekends, i know people who caught it all in a day. it depends on your 'feel' of the kite etc. 3. you need to know how to swim a bit for safety's sake. other than that a bit of courage :) you'll understand why if you take up the sport. i would suggest, head up a weekend to kalpitiya, maybe next weekend - try a 'trainer' kite and perhaps put you on a bigger kite if the wind isnt that strong. if you dont like it - well, you can click away! and i am a kiter. 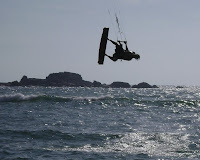 so, i wonder if it possible to come to sri lanka for kiting. i am not an advanced kiter. i dont like choppy and too much wave. if i come, i plan to take the opportunity of Chinese new year which will be from 27th Feb.
btw, i am a kite girl from china. if you could provide the useful advice or if you can guide and show me some spots, which will be appreciated. Great article, Sri lanka has some good spot. My friends had been there. Anyways, kite surfing is the best sport ever invented though it is considered to be an extreme sport, just make sure you know all the basics before heading out.